Preferred stocks are often an attractive solution for income-focused investors searching for yield, especially considering bond yields are still so low and common stocks can be too risky/volatile. Preferreds sit between common stocks and bonds in the capital structure, and have characteristics of both. This week's Fed stress test results have made entry points on some preferred stocks particularly attractive for long-term investors. This article highlights five high-yield preferred stocks that we believe are worth considering. In the Milton Bradley game of Yahtzee (first introduced in the early 1940s), five-of-a-kind is the highest score of any category, and when achieved, it is customary for a player to exclaim “Yahtzee!” This article highlights five attractive investments in the “preferred stock” category, and all five of them offer big yields and attractive prices, in our view. If you are not aware, preferred stocks are often an attractive solution for income-focused investors searching for yield, especially considering bond yields are so low (the 10-year Treasury is only around 2.3%) and common stocks can be too risky (many investors simply cannot handle the threat of high volatility). Without further ado, here are five attractive high-yield preferred stocks that we believe are worth considering. If you are an income-focused value investor, we believe Teekay’s Series-B preferred shares (TOO-B) currently present an exceptional opportunity based on the very high yield and significant price appreciation potential. Teekay Offshore Partners (NYSE:TOO) is a provider of marine transportation, oil production, storage, long-distance towing and related services. And even though this industry has faced a variety of challenges in recent years, we believe Teekay has the financial wherewithal to keep supporting the preferred share dividends, and we expect the share price will continue to rebound sharply in the coming months. For some recent background, the market dramatically overreacted to bad news on May 18th (i.e. 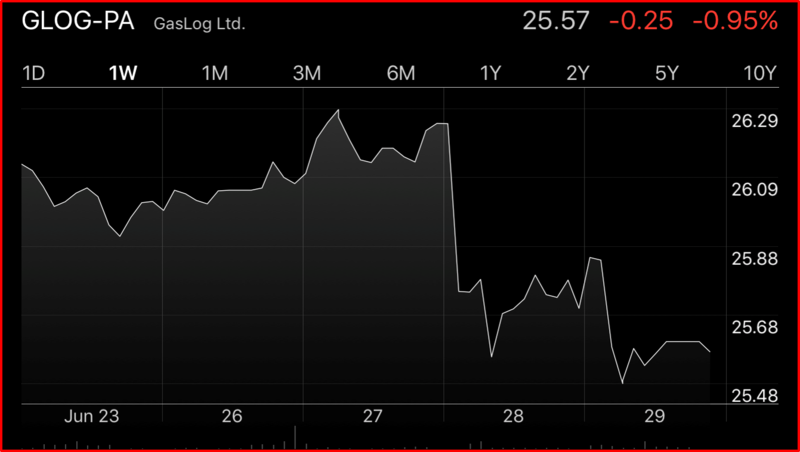 a cancelled contract by Petrobras (NYSE:PBR)) and again on June 9th (i.e. 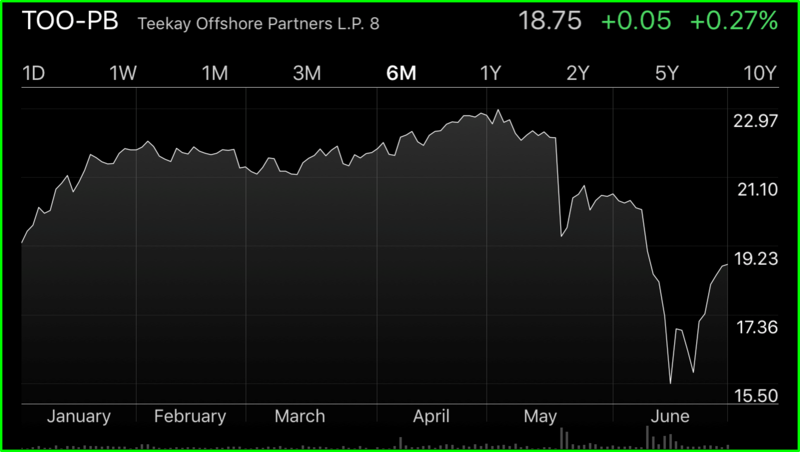 a Morgan Stanley downgrade), as shown in the above price chart. However, given the size of this contract, and the strength of Teekay, we believe the company will continue to be profitable, continue to generate positive cash flow, and continue to support the preferred share dividend payments. And even if liquidity becomes too tight, Teekay can easily free up more than enough cash by cutting the common share dividend, if need be (preferred shares are higher in the capital structure than common shares, and these preferred dividends are cumulative). We already shared this idea within The Value & Income Forum earlier this week, and more information on this idea is available in our members-only report: Attractive 11.4% Yield Preferred Shares With Significant Upside. It has been a great seven months for big banks since the November election, and it has been a great couple weeks considering all of the big banks passed the Fed’s latest round of stress tests and had their shareholder capital return plans approved. However, if you are a value and income investor, you may realize there is a lot of optimism already baked into big bank stock prices, and the yields remain unattractively low. 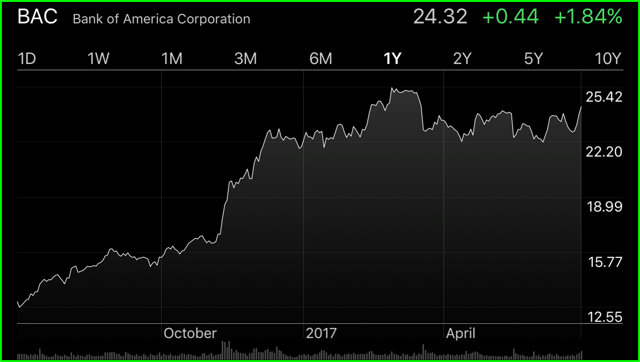 For example, Bank of America (NYSE:BAC) just rallied nearly 90% over the last year, and its dividend yield is still just under 2% even after this week’s announced increase. However, if you are an income-focused investor, one solution to this situation is Bank of America’s floating rate non-cumulative preferred stock (BML-L), currently yielding 4.3%, and offering dividend increases if interest rates rise. These particular preferred shares (BML Series L) currently trade at a discount ($23.56) to their liquidation price ($25), and they also offer an attractive 4.34% dividend yield. But one of the things that makes these shares particularly attractive is that the dividend rate will rise (you’ll get paid more money) as interest rates rise. Specifically, the floating rate will be equal to the three-month U.S. dollar LIBOR plus 0.50%, but will not be less than 4.00% per annum (the reason the yield is currently above the minimum 4.00% is because the share price is trading at a discount, as described above). Also important, the dividends paid by this preferred security are eligible for the preferential income tax rate of 15% to a maximum of 20% (this is important if you are tax sensitive). First, Bank of America is dramatically safer than it was 10 years ago when the financial crisis started. For example, BAC (along with all other US banks) just passed another annual round of increasingly stringent regulatory stress tests. Specifically, the reserve requirements for banks have been made much more conservative (the banks are safer) than before the crisis, and banks (including BAC) are using much less leverage (again, making them much safer). Second, even if Bank of America were to face challenges in the future, the government and regulators would do everything they possibly could to prevent BAC from failing (it is simply too systemically important to our financial system). 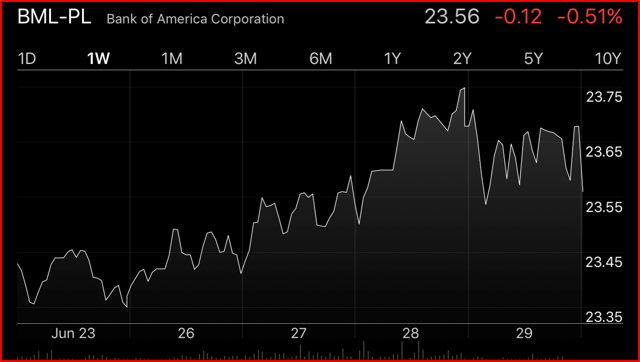 Further, another bank would likely step in and buy Bank of America (at an extremely discounted price) if it became too distressed, and then it’d be on the hook for the dividend payments. In fact, that’s how BAC got these preferred shares in the first place. These shares were originally issued by another financial institution (Merrill Lynch), and BAC is on the hook for it now because BAC took over Merrill Lynch during the financial crisis. Honestly, we don’t see another financial crisis in the near future because the economy is much healthier now and the banks are much less risky (thanks to dramatically more stringent regulatory capital requirements). And for your reference, here is a link for all the details of these preferred shares from Quantum online: BML-L Search Results - QuantumOnline.com. Overall, we believe these Bank of America preferred shares are very safe. Not only are they safe from default (as we described above), but they’re also safe from rising interest rates because the interest rate is floating. And finally, we especially like the shares because they are trading at a discounted price relative to the liquidation value. If you are looking for big safe income, these Bank of America preferred shares are absolutely worth considering for a position in your diversified investment portfolio. Though technically not a preferred stock, these “baby bonds” from Prospect Capital (NASDAQ:PSEC) have a lot in common with preferred shares, and they are worth considering if you are an income-focused investor. Regarding similarities of PBB to preferred shares, they both have a redemption value/par value of $25, they pay cash quarterly, and they’re higher in the capital structure than common stock, but lower than senior bonds (these particular bonds are unsecured and unsubordinated obligations). One important difference between these baby bonds and a preferred stock is that the baby bonds pay interest, not dividends, and this has different tax implications (i.e. you’ll likely pay tax at your ordinary income tax rate instead of the lower dividend tax rate). 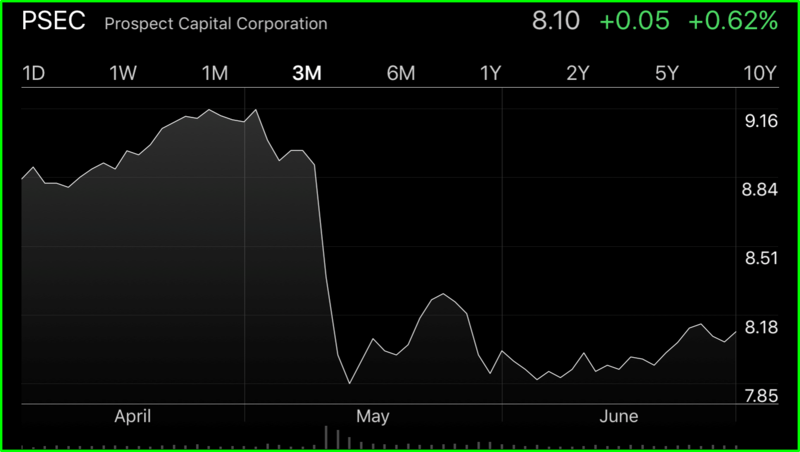 If you are not aware, Prospect Capital is a big-dividend business development company (“BDC”) that has faced challenges this year as the share price has fallen nearly 15% over the last several months (during which time the S&P 500 posted gains). We recently described the BDC industry headwinds and risks in this bearish article on Prospect Capital about a week before the share price cratered: 3 Overcrowded High-Yield BDCs: Prospect, Main Street And Fidus. Note: The above PBB graph has been adjusted to represent total return (price plus interest payments). Our thesis on the Prospect baby bonds is that the price is much less volatile than the common, but the yield is still attractive at 6%. Granted these shares are trading at a $1 premium to their par value, and they are redeemable by the issuer at $25 starting on 12/15/2018, but realistically why would Prospect call these bonds when they offer roughly the same yield as their current overall cost of debt Prospect Capital Corp. WACC % (especially considering interest rates are rising). Plus, the cash outflow on the bonds is still less than the dividend payments (12.4%) on the equity shares. And if Prospect ends up in a liquidity squeeze, it’ll first cut the big dividend on the equity to free up cash flow to support the bonds (bonds are higher in the capital structure). And in that case the equity price would likely fall dramatically while the bond price would remain fairly steady (i.e. the bonds are much safer than the equity). 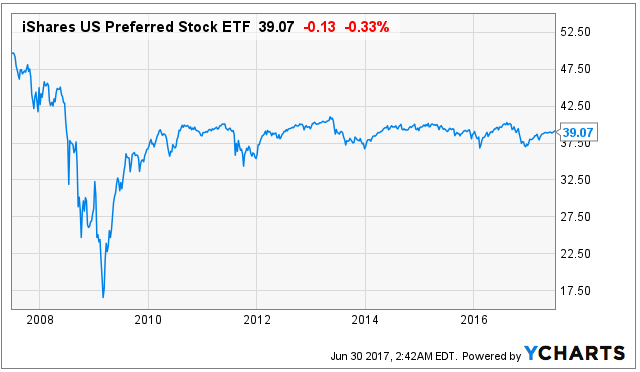 If you like the higher yield of preferred stocks, but the risks of individual securities are still too much for you to handle (even though they’re much less volatile than common stock), you might want to consider a preferred stock ETF. 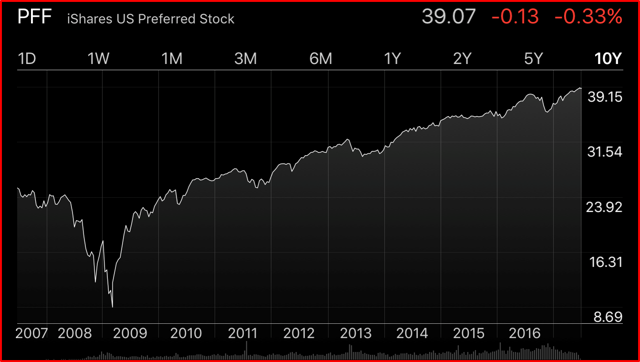 For example, iShares offers a passive preferred stock ETF (that is comprised of a basket of many preferred stocks, thereby dramatically reducing the risk), and it currently offers a 5.6% dividend yield. Plus the payments are made monthly. The objective of this fund is to track the investment results of an index comprised of U.S. preferred stocks. And the price of this fund has exhibited very low volatility since 2010 (the price has consistently hovered right around $39). 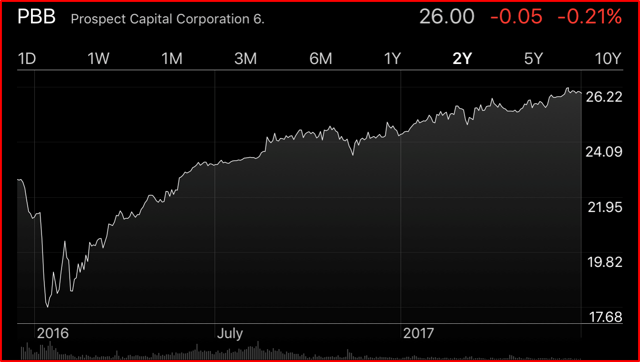 As a reminder, the price has stayed around $39 per share, but that does not count the big steady dividend payments (current yield is 5.6%). This next chart shows the total return (the price has been adjusted for the dividend payments). Unlike owning individual preferred stocks, you have to pay a management fee on this fund, but at 0.47% the fee is fairly reasonable. Overall, if you are looking for higher yield than common stocks, and you are looking for lower volatility and more safety, this iShares preferred stock ETF is worth considering. GasLog (NYSE:GLOG) is an international owner, operator and manager of liquefied natural gas (“LNG”) carriers. GasLog has faced macroeconomic shipping industry challenges in recent years; however, the company has weathered the storm better than many other shippers because of its focus on LNG. Specifically, increasing supply of LNG has been absorbed by increasing demand (unlike crude shippers that have faced more imbalance challenges). GasLog currently offers some high-yield preferred shares (8.5% dividend yield) that are not redeemable until 4/7/2020. We like these shares because we believe the dividend payments are very safe. 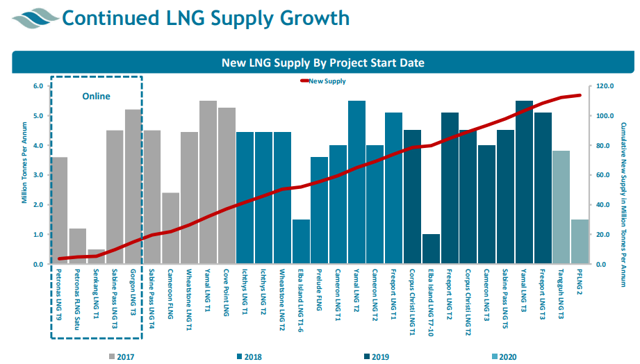 For example, GasLog just achieved a record quarter for revenue and EBITDA. 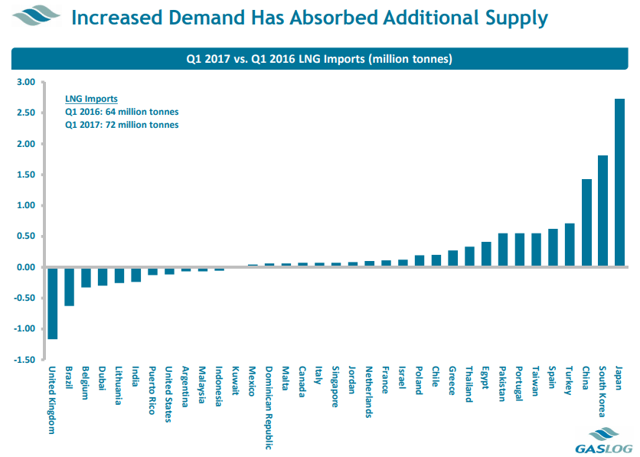 Additionally, increased demand for LNG has been absorbing increased supply. 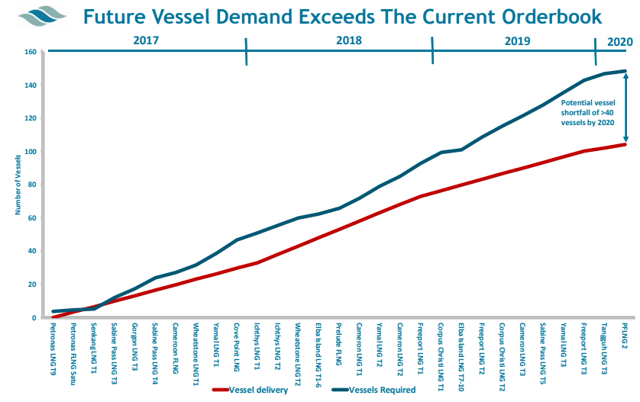 Plus, the future vessel demand exceeds the current order book. Also positive, GasLog continues to pay a dividend on the common shares, which means if the company does get stretched on liquidity, it can easily cut the common dividend to free up cash to support the preferred shares (preferred shares are higher in the capital structure). These particular preferred shares are cumulative, which means if GasLog misses a preferred dividend payment, it’s still on the hook to pay it later (this is more attractive than non-cumulative shares). Overall, based on the strength and outlook for the industry, and the financial wherewithal of the company, we believe these big preferred share dividend payments (8.5% yield) are worth considering, especially considering the share price just pulled back this week, and the shares now trade very close to their redemption price ($25.57 versus $25.00) instead of at the larger premium that has existed over the last few months. For many investors, the search for yield can lead to preferred stocks because of their lower volatility and higher yields. We believe the five highlighted in this article are very attractive. And if you are looking for more high-yield preferred stock ideas, consider our members-only version of this report: 5 More Attractive High-Yield Preferred Stocks Worth Considering. The yields on these additional five are 5.3%, 6.8%, 4,8%, 9.2% and 14.5%, and we own securities issued by the last two (the 9.2% and the 14.5%). And very importantly, investing involves risks (much higher than Yahtzee). We recommend owning a diversified portfolio customized to meet your personal tolerance for risk and your individual investment needs and objectives.